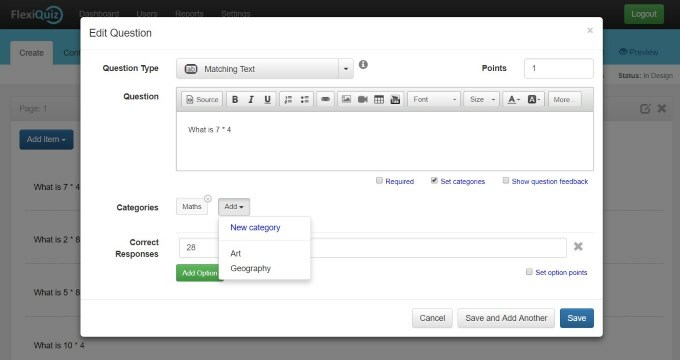 The question bank feature allows you to create and categorize questions that can then be used across multiple quizzes. The question bank can be accessed by pressing the Add item button, within the Create screen, and then selecting the Question bank option. If you select add to quiz, then you are shown a further dialog where you can select how many questions will be included. If left blank, then all questions within the category will be included within the current quiz. However, if you enter a value then the set number of questions from the category will be randomly selected and added to the quiz each time it is taken. You can add a new question by pressing the green button. You can also edit, delete or copy a question directly to your quiz by pressing the relevent select action button. If you would like to filter the display then just press the Add button in the top right corner. Multiple categories can be added to the display filter. While editing a question there is a Set categories checkbox. If selected, you will have the option of assigning categories to the question. By default, a summary of the category scores will be shown on the response report when viewed by an administrator or trainer through the Analyze or Reports menu. You can also set the category scores to be displayed to the respondent by navigating to the Results tab, within the Configure screen, and then selecting the option for Show category scores.